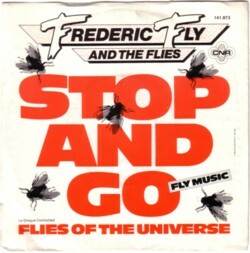 In 1982 there was a 45 released on CNR by a band called Frederic Fly & The Flies. They do two songs: Stop and go (Fly music) and Flies of the universe . The label says that the songs are written by Songstone and Hammerstone. The record never was a hit; I even doubt if it was ever played on a radio station. But it one of the best records in my Adam Ant collection! I think that this was the work of the Catapult guys; it sure has their sound. They did a great job. Both the lyrics and the music are very Adam Antish.